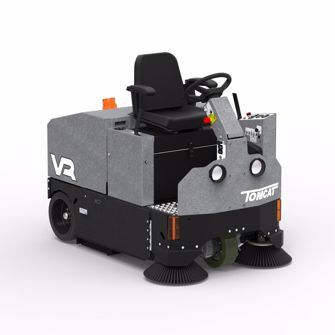 Tomcat’s VR floor sweeper was designed from the successes of the now retired Model 34. It was made to be compact but not considered light-duty because they work great in commercial settings like factories, warehouses, steel and paper mills, stables, tennis courts and any other facility that has a lot of debris on the floor. The dual high speed side brooms pick up anything in its path and stores it in the hopper to be emptied later. It can pick up bags of cement without a trace of dust left behind. The VR riding sweeper works on any floor type, including AstroTurf, and the battery power on the VR floor sweeper runs for up to 7 hours on a single charge. Why buy a Tomcat VR? Built for cleaning any type of floor with side brooms for corners and along the wall, and a tubular broom under the machine packs all the debris into a steel hopper. The second stage vacuum traps dust in a bag-house filter that will last a lifetime. It saves you money by cutting labor costs. No specialists are needed to operate a Tomcat sweeper. Controls and maintenance are simple – no oil changes, fuel leaks or spills, brooms to reverse, or tanks to exchange. At only 68 dBA it is quiet enough for any facility! Broom Length: 32" x 10"
Side Broom Size (2): 17"
Dimensions (LxWxH): 64" x 37" x 55"